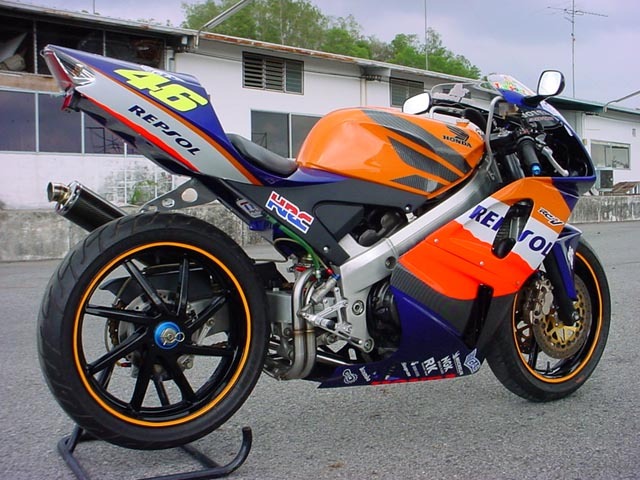 Having made several projects for the NSR250, we decided to have a go at making a similar upgrade using a four stroke 400 sportsbike. The NC30 was an obvious choice being a very popular model when new so plenty were made between 1989 and 1994. 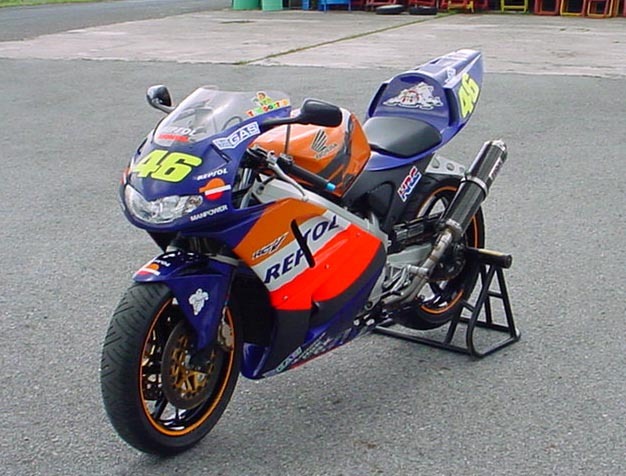 Mostly, it was a Japanese home market model but it was also sold in the UK and thousands have since been imported as used bikes as well as to many other countries of the World. It is a solid bike with good reliability, handling and reasonable performance. It is a bit out of date now and could do with upgrading to keep it popular for a few more years to come. We set to work on the seat cowl first because this is the most difficult part to get to fit. 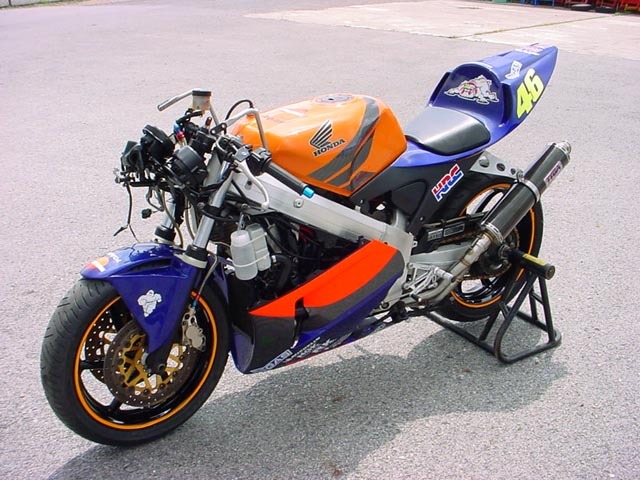 Experience with the NSR seat cowl had taught us that we would be better off junking the stock subframe and building our own one along with an accompanying battery box. We realised too, that this gave us the freedom to reposition the gas tank into a more aggressive angled position. Starting with two big cans of polyurethane foam ingredients, Matt and I (Paul), pulled off the tail end of the NC30, made a big box to hold the foam, and poured the chemical concoction straight into it. 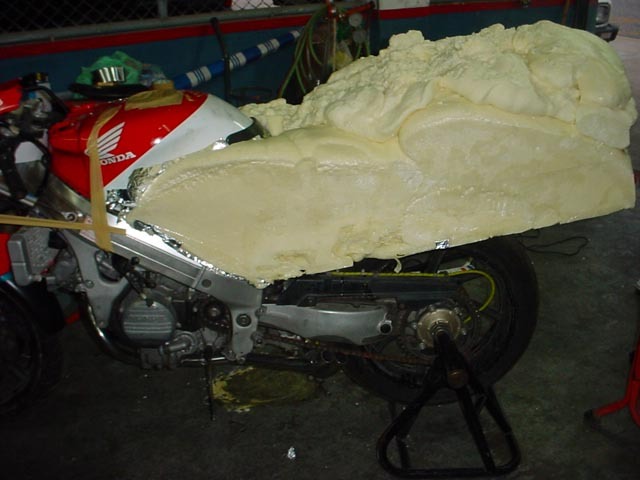 Apart from the goo which ran down the suspension, the rest foamed up as it was supposed to and set so we could carve a seat cowl out of it.After around 90% had been shaved away, we were left with the rough idea of what we wanted. 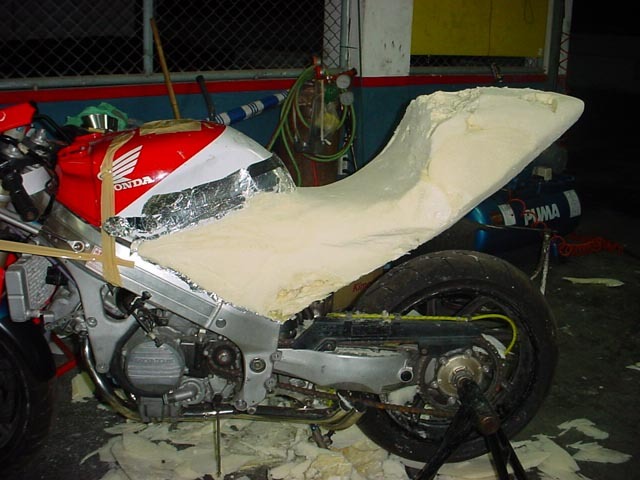 Our bodywork guy, Mr Thanet, tried not to laugh when we turned up with our feeble efforts of prototype model making and set about making us a real one out of fiberglass and filler. To cut a very long story short, we eventually ended up with the seat cowl you see in the pictures. 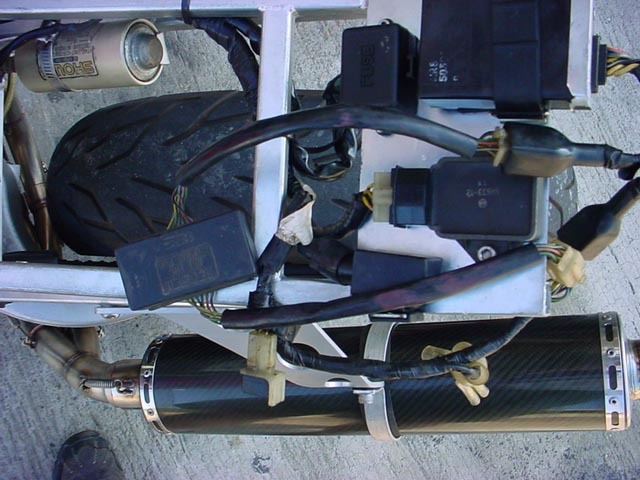 The subframe and battery box were developed concurrently with the seat cowling. Although you can't see either component once the seat cowling is on, we have endeavored to give them a racy appearance, as well as make them function in much the same way as the parts they replace. 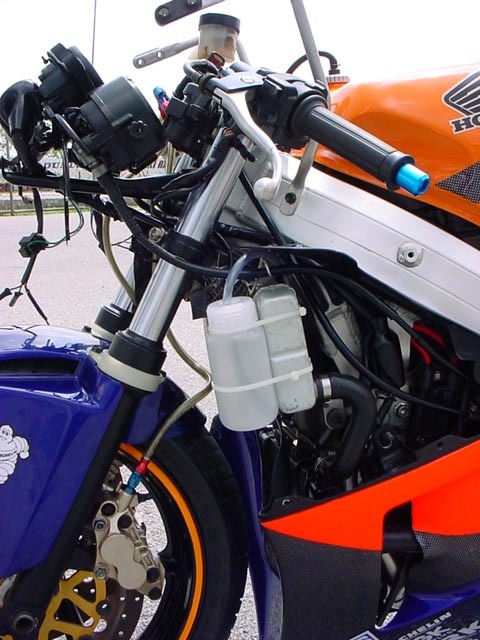 We decided that the rear master cylinder reservoir should be binned in the interests of style and image and we replaced it with an HRC rear brake reservoir kit as fitted to GP bikes. We also did away with the radiator coolant top up tank and replaced this with another HRC component. This is strapped to the left of the top radiator, out of the way of the seat cowling. Using the locating positions on the new subframe we remounted the rear coil, the CDI, the flasher and starter relay, regulator/rectifier and fuse box. The wiring loom was kept intact but repositioned and strapped down with cable ties. The next issue was the tail lighting. 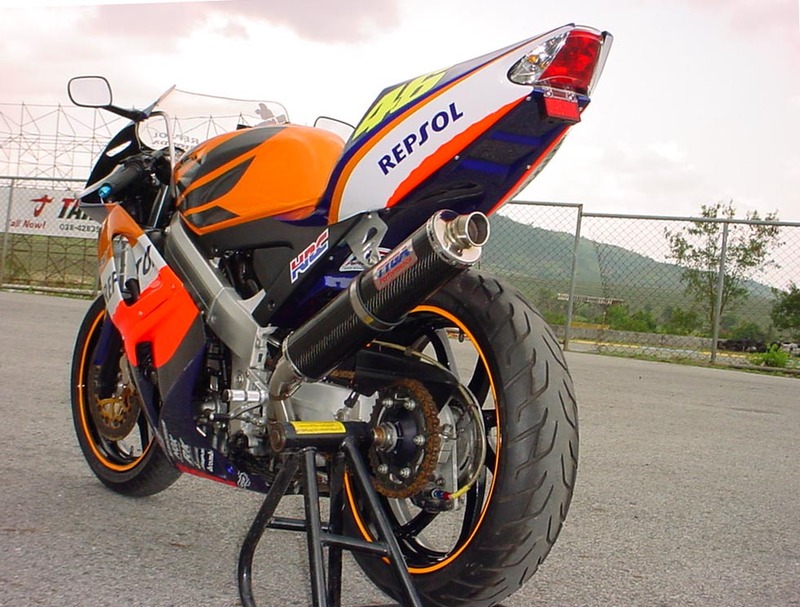 When you consider that the RC211V doesn't actually have tail lighting, then this becomes even more challenging. 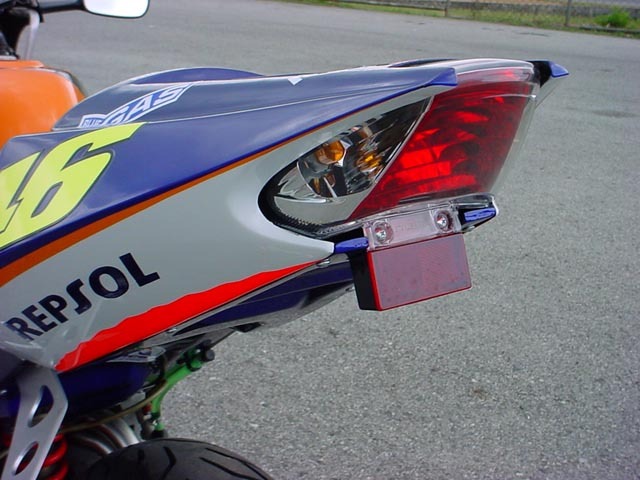 We settled on the taillight/turn signal assembly shown in the pictures. Not only is it stylish with the indicators hinting at the pointed tips of the RC211V, it also illuminates brightly and is easy to see by following traffic. It even comes with a number plate light, so it is very practical. The connectors plug straight into the stock loom and the unit is rubber mounted to prevent vibration. 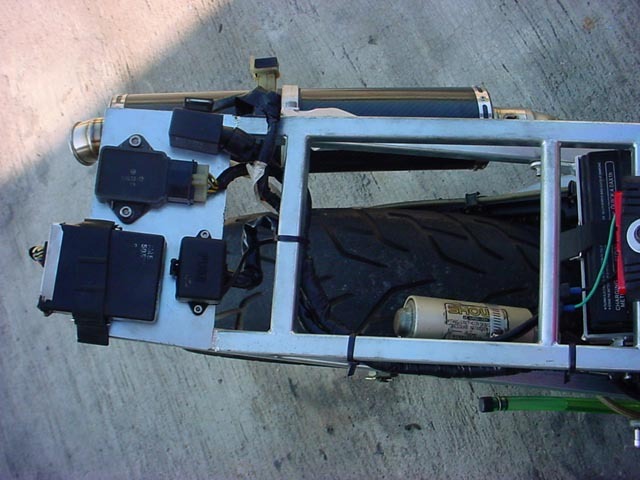 In order to fit the seat cowl and make the bike look right, we relocated the fuel tank. It now lives under the seat like the GP bike... just kidding! No, we tilted the tank up a few centimetres at the rear and moved the tank backwards a little too so that it now sits at a slightly more rakish angle to gives the bike a more aggressive poise. What with the tank angle and the seat cowling, the seat position is raised significantly. For most riders, this gives more comfort in the legs as well as a more forward bias on the bars resulting in more racy ergonomics. That's not all, we moved the seat pad back a couple of inches from the stock position to facilitate a longer seat area. Now six foot plus riders are able to get into a racing crouch, an impossibility with the stock seat cowl unless you wanted to use the passenger position. The other upper fairing is the 'Suzuka'. 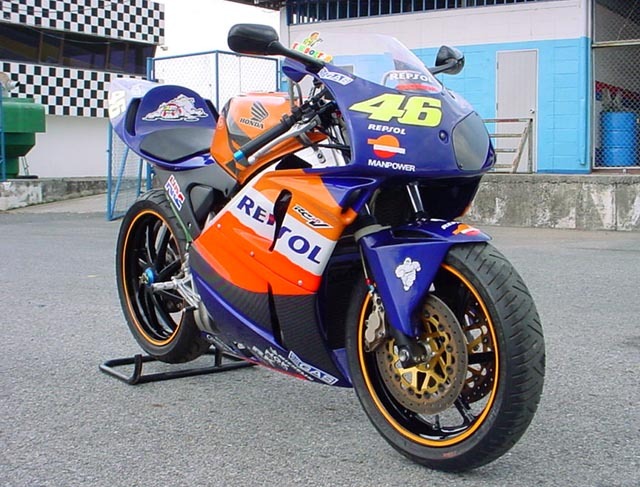 This is of the same style as the ones on the bikes which compete in the Japanese 8 hour endurance race. It utilises one of the original NC30 headlights along with a spotlight which is switched on when the high beam is selected. These are hidden from view by a tinted headlight cover. How good is the beam? Let's just say it would be better with a clear cover, but then again the headlight wouldn't be hidden from view if that were fitted. Its all about personal style!. The upper cowlings use TYGA screens. 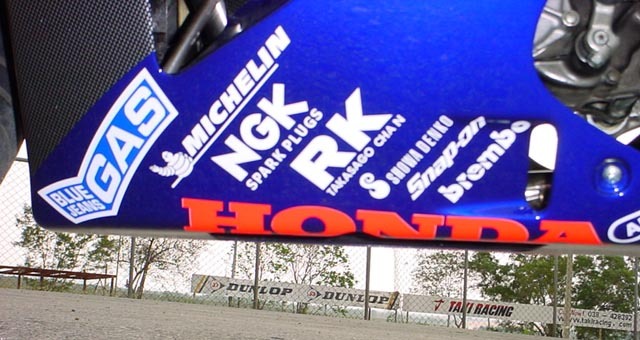 The Spark is the same as an NC35 one and the Suzuka now uses a stock NC30 one. We chose clear Perspex to keep with the racer look. 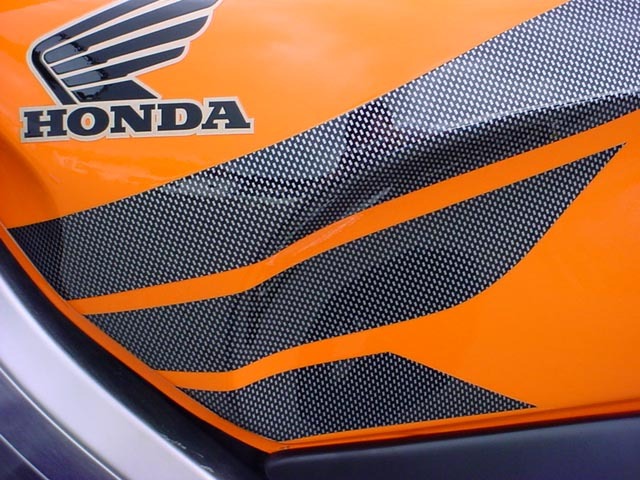 The screens are predrilled to match the fairing holes and are supplied with plastic screen rivets. These are easy to fit and won't crack the screen when fitting. 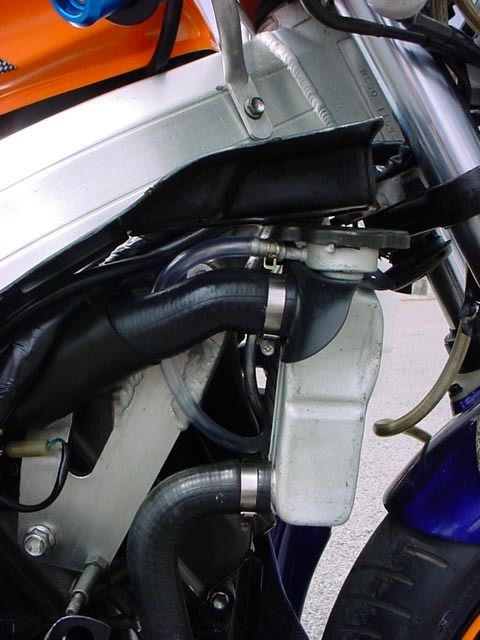 Both upper cowlings retain the stock mirrors, though our bike has NC35 ones fitted in the pictures because they were at hand. 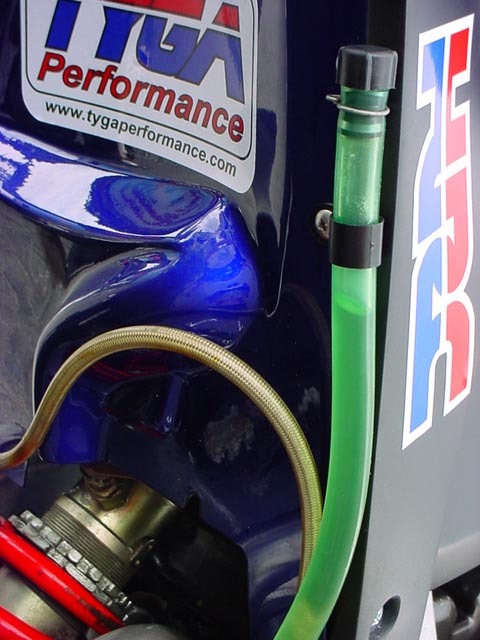 The lower cowling is also a TYGA Performance component but is of stock shape and this allows the upper cowlings to be fitted to either TYGA or stock lowers if preferred. 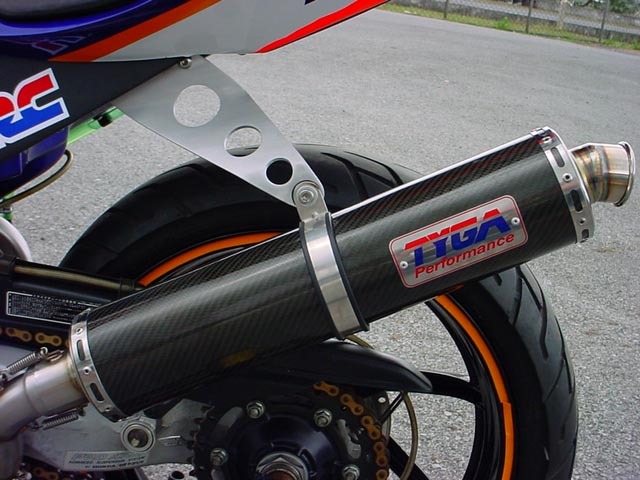 The TYGA lower cowling we chose is the street version with an open bottom and retains the small lower side vents. 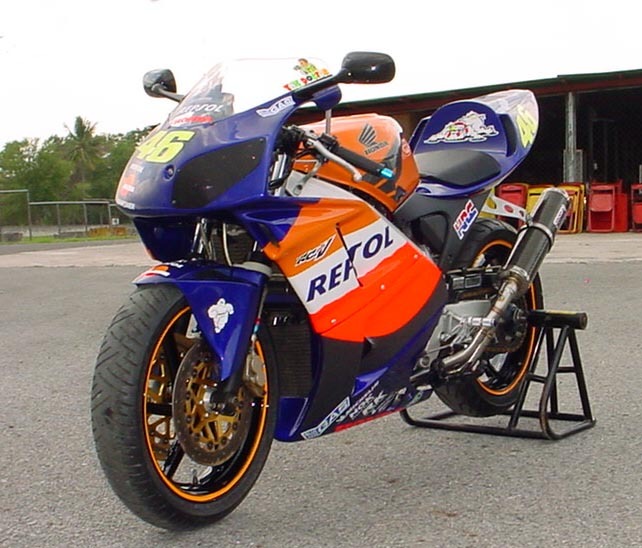 As we don't intend racing this bike, the closed race version was considered unnecessary. The last bodywork component fitted is the front fender. 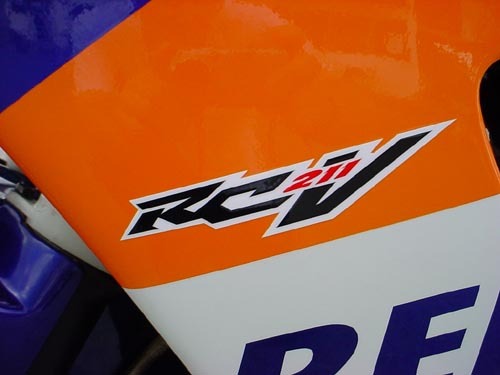 Most people are probably aware that there is, erm, quite a few differences in both appearance as well as performance between the RC211V and the NC30 front ends. 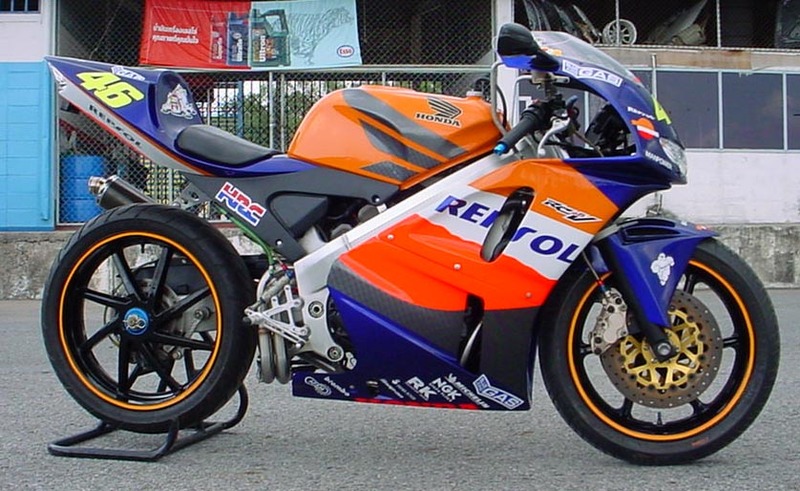 The NC30 forks being right way up is the most obvious difference. 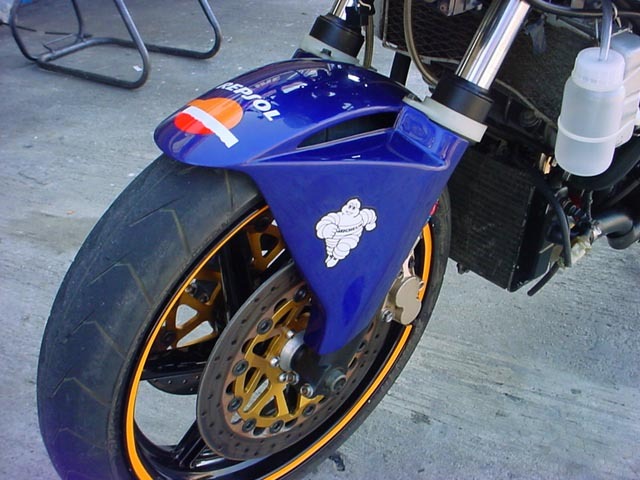 In addition, the stock fender utilises plastic rings over the fork legs to mount them. 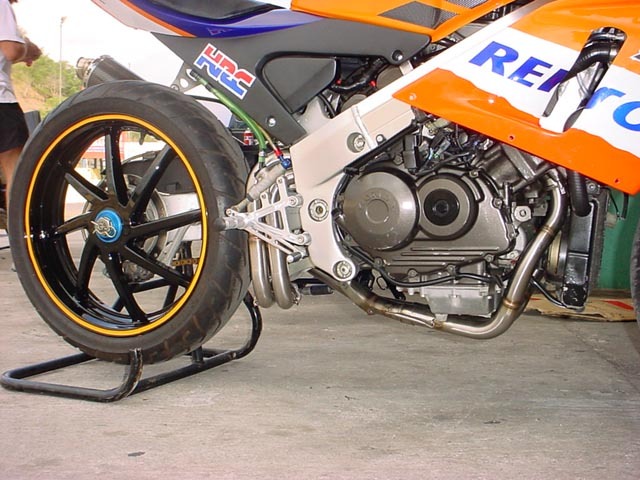 These are retained on the TYGA component and the styling of the RC211V front fender carried over to give the front end a more modern and substantial look without the expense of having to source an upside down front end. The chassis is more or less stock. The NC30 is a solid bike with a massive headstock and sturdy frame and forks. 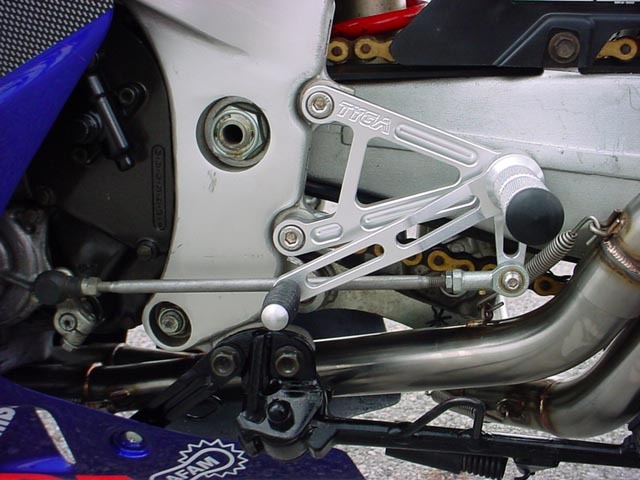 We kept the stock remote gas rear shock as fitted to later models. We also kept the two way adjustable front end although we did opt for 10mm more oil than standard to stiffen up the front end a bit. We will see how we go and if necessary fit a different shock linkage in the rear to raise the ride height. This will only be to quicken the steering because seating position is already much improved with the new seat cowl. 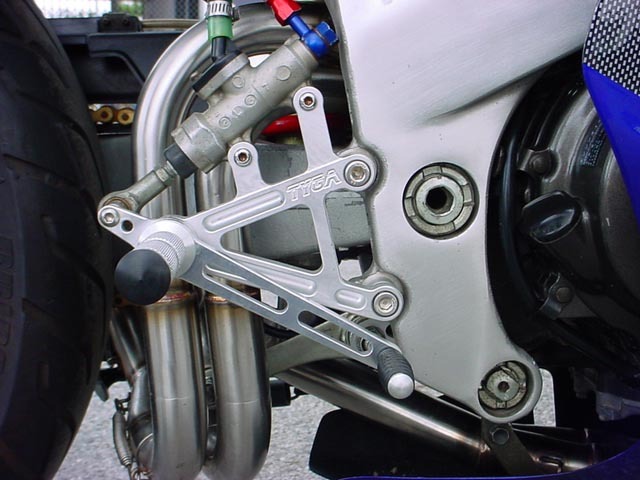 As with our other project bikes, a TYGA step kit keeps your feet off the ground and allows for precise gear changing and braking. The extra height is really appreciated with the now higher seating position. We fitted braided lines all round and, with different fittings, this facilitated moving the rear master cylinder to the inside of the step kit hanger. 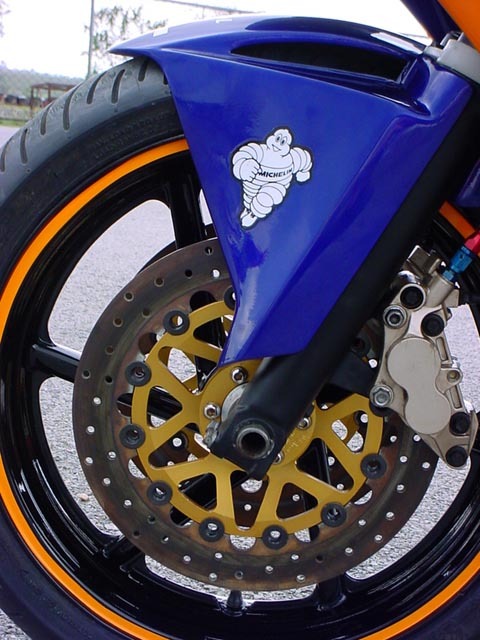 Front rotors are cast iron and as well as looking very pretty, do a great job of slowing the bike down. Callipers are off an earlier NC30 and are gold in color instead of black of later model NC30s. Other than the brake line, the rear brake is completely stock. The wheels are stock NC30s. 18" rubber is getting harder to find so a switch to 17'" Magteks or similar is a possibility for the future. 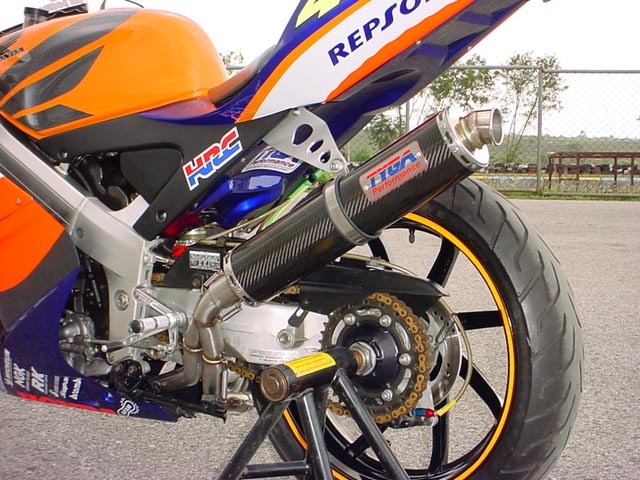 The NC30 is fitted with a TYGA Performance full race exhaust system, designed with maximum power in mind. The pipework is made from TIG welded stainless steel and all joints secured by springs for that 'factory' look and feel.The silencer is our TYGA Performance lightweight carbon one with stainless steel end caps and a 50mm bore to give the full V4 sound. 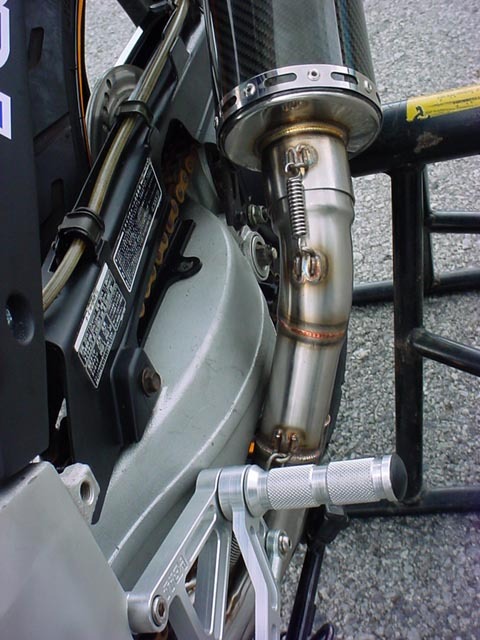 The silencer is secured to the TYGA RC211V style seat cowl subframe via a TYGA Lyte exhaust stay. The stock NC30 stay can be retained but our donor bike came with a corroded stock one that had definitely seen better days. 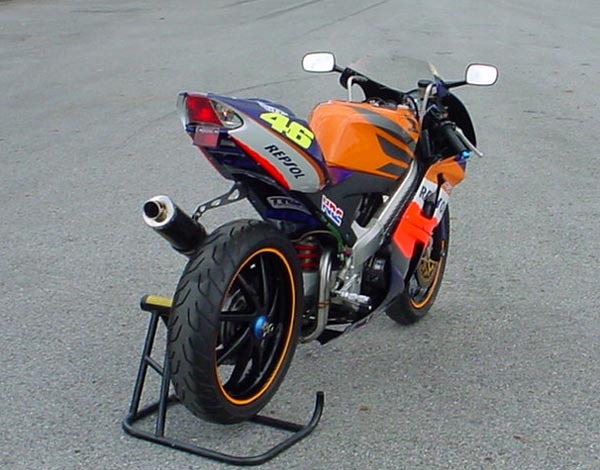 The TYGA component completed the replacement of old with new at the rear end of the bike. 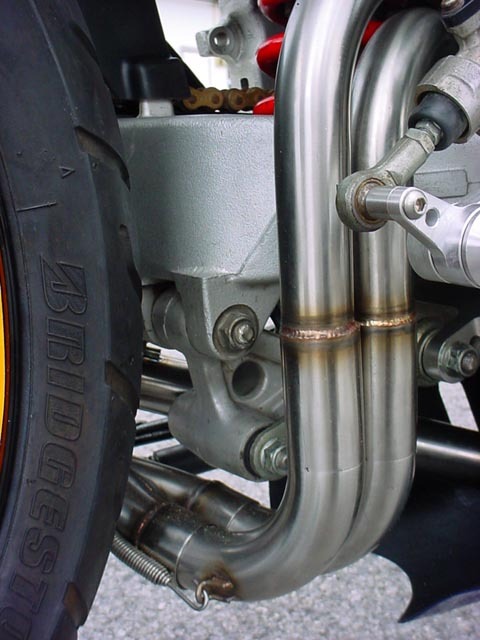 The exhaust fits snugly close to the swing arm on the left and clears the sidestand. 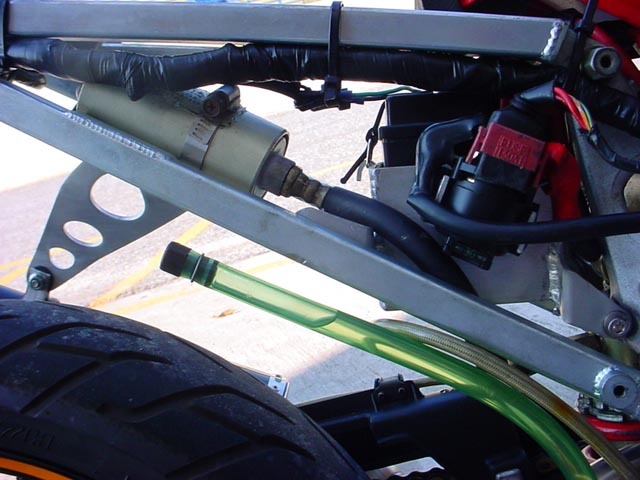 It also offers plenty of clearance under the rear shock if increased ride height is required. 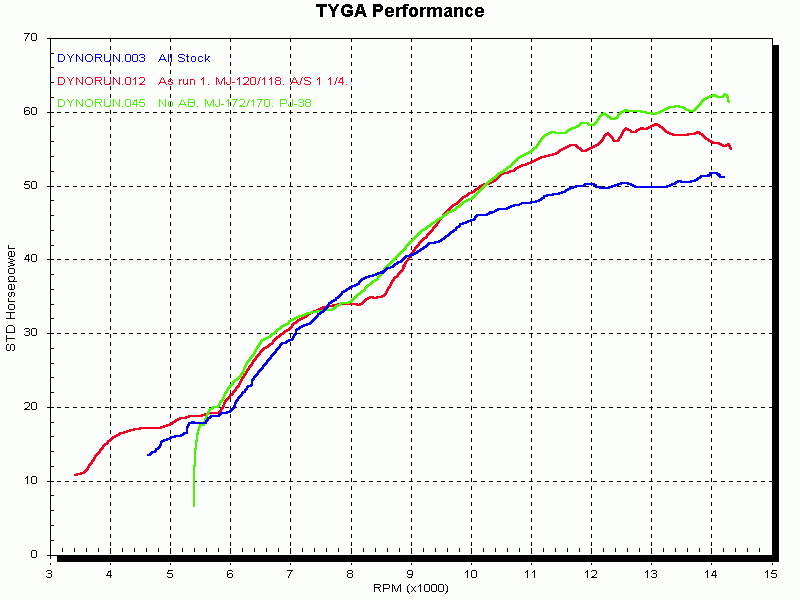 The advantage of the TYGA race system over the stock exhaust can be clearly seen on the following dyno graph. The blue line indicates the complete stock set-up. Nice and smooth all the way from low down, but running out of puff quite early on. Everyone wants more power, so we even tried removing the (restrictive) airbox. This needed some radical re-jetting, but was worth it for the induction roar alone! The biggest bonus though was another hike in ponies, up to 62hp (green line). 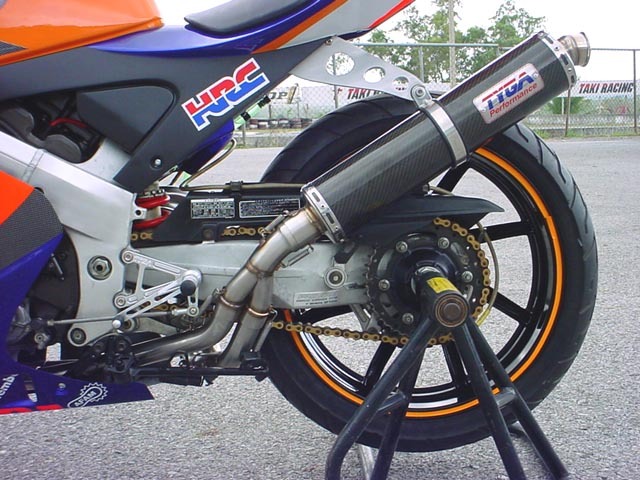 Given that the engine was totally standard, 10hp (or nearly 20%) extra power over standard shows clearly the TYGA Pipe's potential. The TYGA Performance NC30 Rossi Replica runs with nearly stock electrics although we have fitted an HRC derestrictor box to overcome the speed restriction. 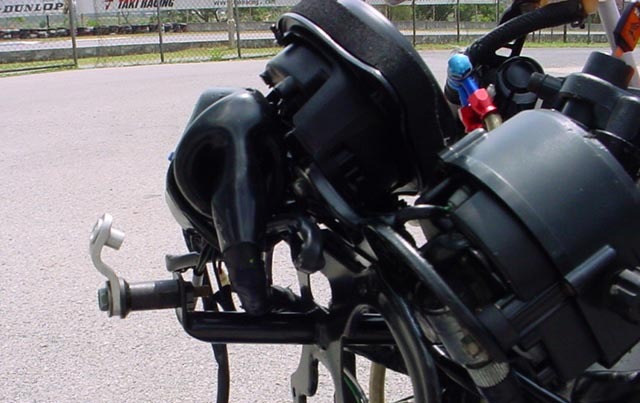 This allows the engine to rev out in every gear without the engine missing; a characteristic of the restricted bike on full throttle at high speed in top. The needle now happily goes off the scale and well into the 'Nippon Seiki'! We have plans to change the instruments but for now it still runs the stock NC30 ones. These are starting to look a bit dated and are now the most obvious tell tale sign that our project bike is an 80s era model. 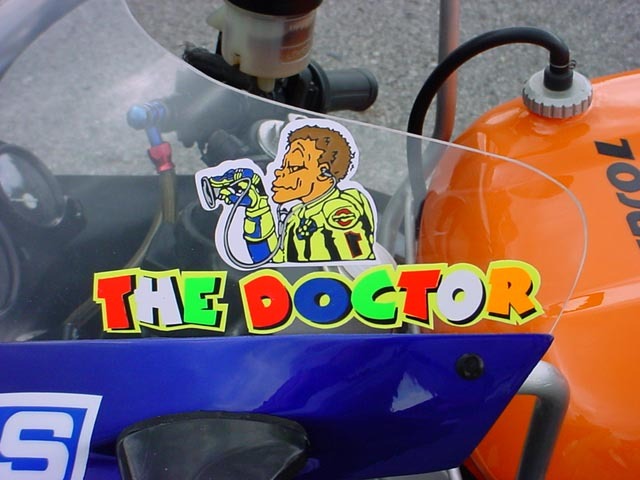 It had to be a full-on Rossi Replica paint job. Why? Because we can. And because the seat cowling demanded it. 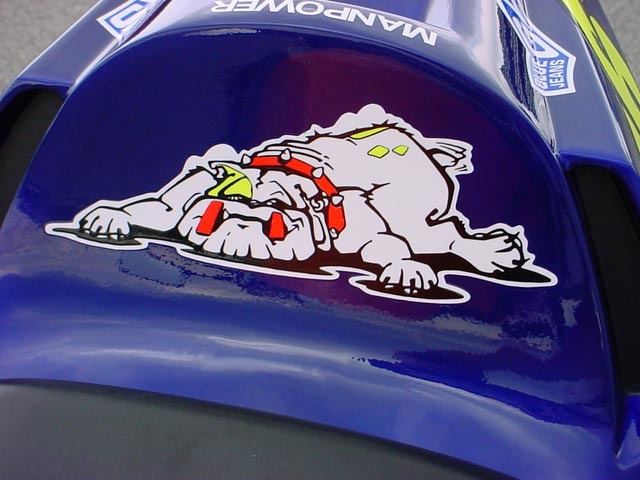 We chose the earlier 2002 scheme with its brighter prettier metallic blue. 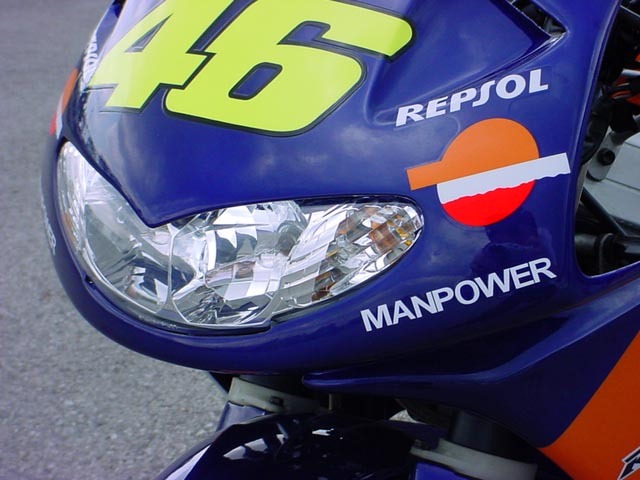 The sticker kit is pretty comprehensive and we included all the sub sponsors though they are a bit smaller than Rossi's owing to the reduced canvas of the stock shaped NC30 lower cowling. Rossi is famous for his various caricatures and we have reproduced a couple of them on this bike with his now familiar dog and 'The Doctor' cartoons. 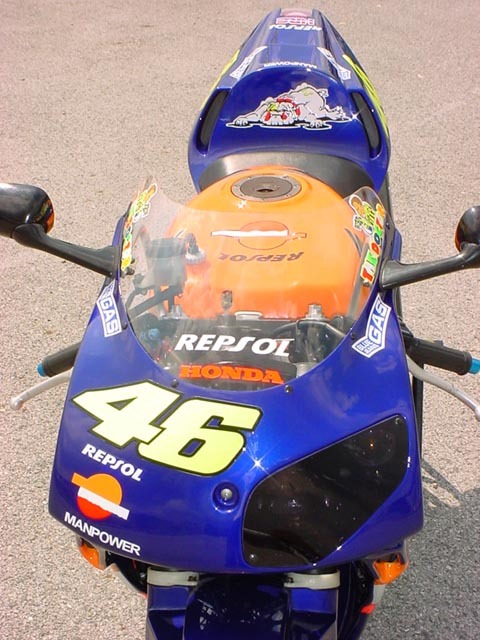 We used carbon look sticker on the tank and on the lower cowling but left the seat cowl flat black which looks fine as it is. 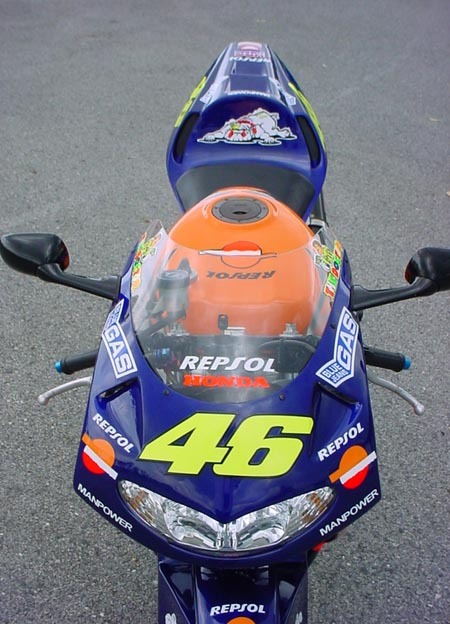 The red and the yellow stickers are really bright on the Rossi replica. 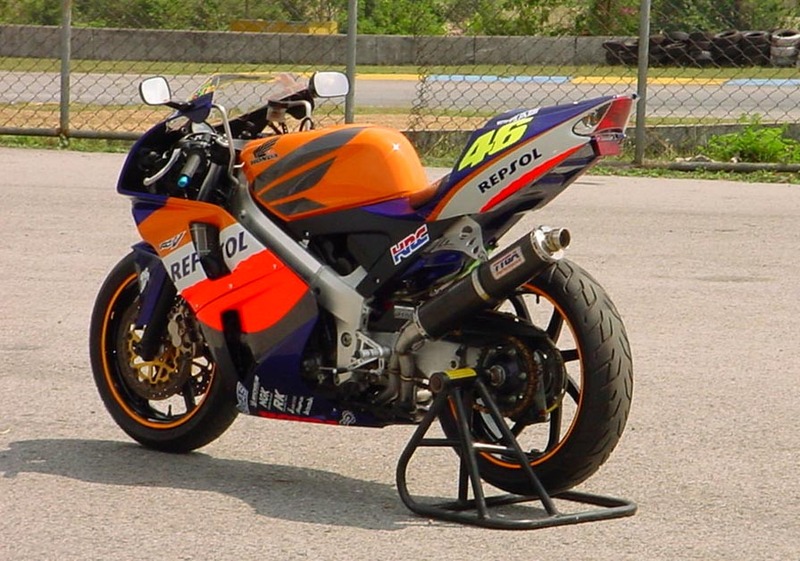 Due to the tank shape, the orange had to be painted on and is not quite of the same intensity, but make no mistake this is a very bright bike. Not much chance of someone not seeing you coming and pulling out on you! We added a few anodized items for good measure, just in case the bike wasn't flashy enough already. The bar end weights were missing on our bike and a trip to the local bike shop provided us with some lightweight blue ones. 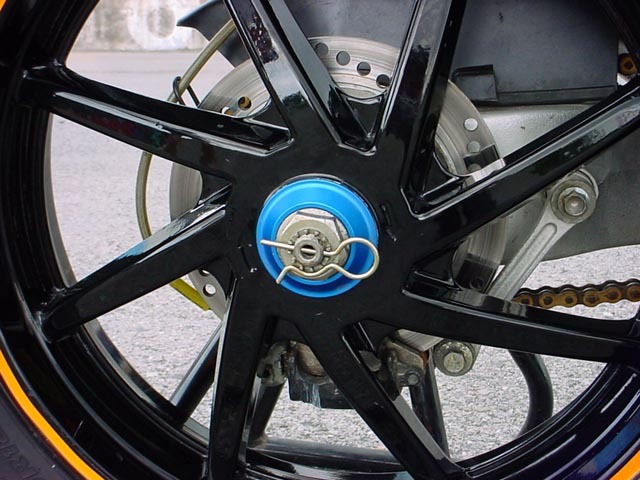 We also substituted the rear wheel spacer for an anodized one. We intend to fit anodized preload adjusters and possibly anodized dust caps too just to finish the job off. We haven't got that far yet... I imagine it will make you feel like a champion regardless of performance. The looks and sound are going to get most people's attention when you are riding such a bike. You'd better be ready to do side saddle wheelies, one handed celebration burnouts and be able to lean forward and kiss the front 46 in a standing wheelie position or you aren't worthy of such a number. On the other hand, if you can't quite manage this, you can always blame the fact you are riding a 15 year old 400. Concerning other things to do, it would be a good idea to fit a steering damper and some new tyres to make the handling nice and sharp. 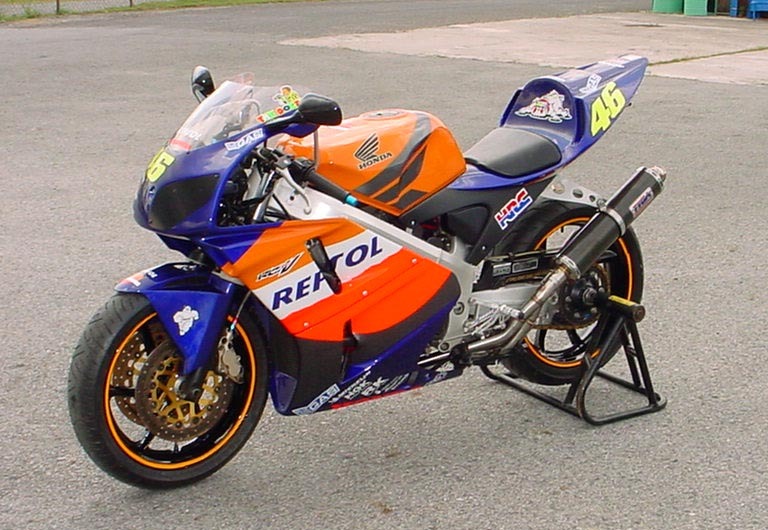 Perhaps an RS250 front end and RS250 NX5 wheels if they will go on. 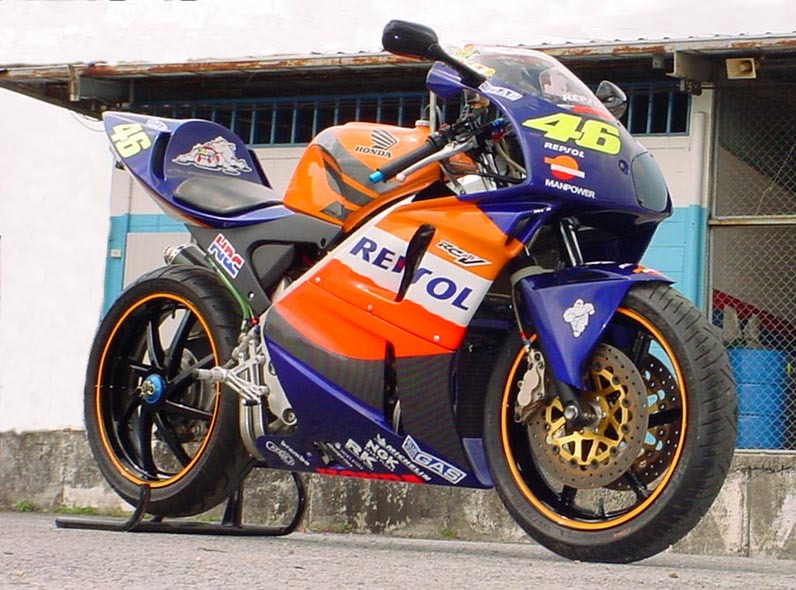 A Brembo master cylinder and a set of modern instruments too. The list goes on but that's the fun of these projects; always something else to plan for.